The recital takes a very small dip in the vast repertoire for chamber music flute published in the 18th and 19th centuries, often found in pocket book collections that, as the liner notes point out, came in innumerable quantities and contained popular airs, dances, and even transcriptions of complete operas for one or two flutes. Bach’s Trio Sonata (link will open new tab to Wikipedia entry) is better known in its version for viola da gamba and clavier BWV 1027, the score of Handel’s Trio-Sonatas op. 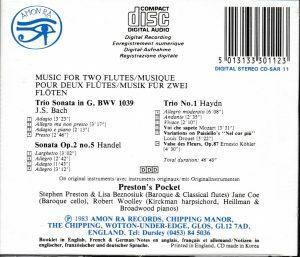 2 indicates that they can be played with two violins, two oboes or two flutes, and Haydn’s trio comes from a set of four composed circa 1794, better known as the London Trios Hob. IV:1-4 (originally written for two flutes and cello, but the scores indicate two violins as alternative) but also listed in his catalog of works as Divertimentos. Mozart’s aria is an anonymous transcription from the early 19th century, Louis Drouet and Ernesto Köhler were two famous flautists from the Romantic era. For those who’d like to know more about the two latter, there is a Wikipedia page on Köhler, and also entries in French and German on Drouet, but not in English. The music is mostly galant and unsubstantial, made for the entertainment of the household, although the Bach Trio Sonata delves deeper. 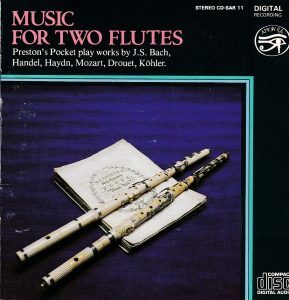 I like the substitution of two flutes and continuo for gamba and clavier (flute one takes the viola part and flute two, the clavier’s right hand); it lends a nice pastoralism to the music, and I find the homogeneity of timbres between both parts quite fascinating (enhanced here by the fact that the cello dominates the continuo), as opposed to the heterogeneity of viola da gamba vs. harpsichord. It’s interesting also to note that the tempo indications are not exactly the same as in the Gamba Sonata: there doesn’t seem to be a major difference implied by BWV 1039’s substitution of “Allegro ma non presto” to the Gamba Sonata’s “Allegro ma non tanto” in the second movement, but there certainly is in the Finale’s turn from “Allegro moderato” in BWV 1027 to “Presto” in BWV 1039, and indeed the Preston’s Pocket group plays them with a greater liveliness than in the customary versions of the Gamba Sonata, and it is very welcome. On the other hand, the Trio-Sonata’s “Adagio e piano” indication for the second movement, in lieu of the Gamba Sonata’s “Andante”, might have warranted a slower approach (one in fact very much embraced by the traditional versions of the Gamba Sonata, often tempted to turn andantes into romantic slow movements). But not so, and the performers take it as a flowing Andante, with an undercurrent of inquietude, which I find entirely taking. The rest of the program is also played with plenty of zest, although “Voi che sapete” is performed with more wistful sentimentality than adolescent turmoil. TT is a short, LP-tailored 46:36.